Host hotel rate is $114.00 for single, double $119, Triple $124, Quad $134 and Suites are $265. Ask for the PNAHA Development Camp rate. Overflow Hotel is The Red Lion with the similar rates. Player check-in is at the Coast Hotel Convention Center from 6:00-9:00 p.m. 2005 & 2004 Player & Parent meeting after check in at 7:00pm. 2003 & 2002 Player & Parent meeting after check in at 8:00pm. Discussion about hockey opportunities, take control of your development plan and question / answer session. All players must check in on Friday, January 26, 2018 and be prepared to hit the ice at 6:15 a.m. on Saturday morning. You will be provided your schedule, team assignment, jersey and water bottle at registration. You must bring with you the Waiver of Liability and Consent to Treat forms, with Parent's signature. If you forgot to print this form go back into the Rocky Mountain Register utilizing your password and print out the forms. These forms are listed in the Summary Sheet under the Player Information window. Reference the screen shot below to locate the link you will need to click on. Note that you will not be able to access Rocky Mountain Register after Thursday, January 23rd, 2019. Welcome to PNAHA's registration process for youth players participating in the PNAHA/Pacific District Development Camps. PNAHA utilizes Rocky Mountain Register to register players for the PNAHA Development Camps. Rocky Mountain Register is the registration process of choice by USA Hockey. 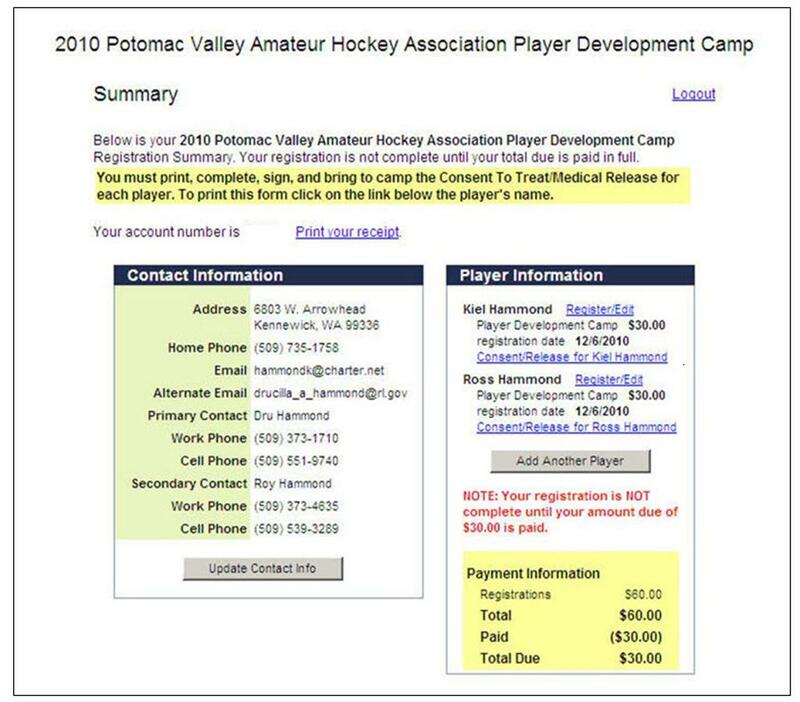 Once you have registered your player in this system your information will remain in the database and each year that your player is eligible for the PNAHA Camp and/or Pacific District or USA Hockey National Camps you will just need to enter your Login (your email address) and password to edit the system and register your player and/or players. So, be sure to keep this information somewhere so that you can retrieve it for future use. Please have your Visa or Mastercard available prior to beginning this process. After you enter your information you will need to pay for your registration. Note that by beginning this process you are demonstrating your commitment to attend the camp. Registration fee for the PNAHA Development Camp is $135.00. This is a nonrefundable fee. There are no exceptions. • Current coaches name, address, and phone number. • The player's statistics (goals, assists, goalie save percentages). • Insurance card including address, phone number, and policy number. Many of the forms needed for the camp require similar information so the system will fill out your registration forms for you based on the information you submit to the Player Profile questions. When you get to the Summary Sheet (Example below) you will be directed to print the USA Hockey Consent To Treat/Medical Release form. Be sure to have the legal guardian sign this form and bring it to the Development Camp with you. Note that under "Contact Information" you also have a button that allows you to update your information in the system. If you have two players attending the camp you can click the button under the "Player Information" section. Billing information is at the bottom of this page. Your registration is not final until payment has been made and cleared. Your account number is located on this page and you can also print out your receipt from this page. If you are a Youth Player (Boys) and have gathered the questionnaire information noted above, and have a valid Visa or Mastercard; please begin the registration process by clicking on the "Rocky Mountain Register" button below. The registration process is complete once you print out your registration forms. You will bring these forms with you to register for the PNAHA Youth (Boys) Development Camp. This link is for Youth (Boys) Players Only. Females need to register on the Women's page. Registration for 2018 - 2019 Youth (Boys) Select 16 & Select 17's Only will open in mid January, 2019. Click the Rocky Mountain link below. 14's & 15's will receive a link and password from info@usahockey.com and register on another site. ©2019 Pacific Northwest Amateur Hockey Association / SportsEngine. All Rights Reserved.